Captain Greig Laidlaw insists Scotland are making progress despite falling short in their bid for a third straight Six Nations win with defeat in Dublin. Consecutive victories over Italy and France had given the Scots hope of equalling their best campaign of 2006. "This team's going forward, and I think that's clear - people should see that," Laidlaw said after Ireland's 35-25 win. "If they don't, I don't know what games they're watching because we were in these Test matches." 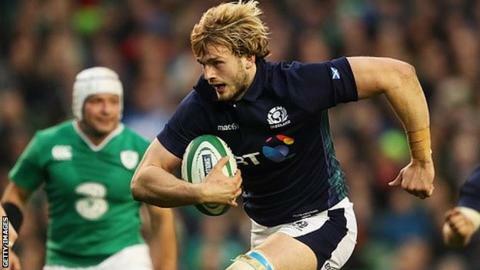 Scotland began with a demoralising 15-9 home defeat by England, before suffering a 27-23 loss to Wales. But the two tries they scored in Cardiff, allied to three apiece in victories over Italy and France, and three more against Ireland, brought a final tally of 11, beating their previous best in a campaign of nine in 2000. "It's not all negative," Laidlaw noted. "We came here and scored 25 points. If we can sort our defence out then we will be in Test matches. I felt we were causing Ireland problems when we kept ball in hand. "Indiscipline let us down. We're disappointed because we talked about how important it was to keep our discipline. We fell the wrong side of some refereeing decisions but that happens. "We just couldn't get our hands on the ball in the early stage. We just had to hang on and ride the storm. We did that but we gave away a couple of tries and once Ireland get away, they are a tough side to bring back. "A couple of times we put kicks out on the full and we just let Ireland off the hook with some inaccuracy." Scotland had flanker John Barclay sin-binned for a breakdown offence after 24 minutes, and Ireland capitalised to score 12 points in his absence. Centre Alex Dunbar was also yellow-carded with 13 minutes left after failing to bring Jonny Sexton down safely after twisting him out of a ruck, and Ireland swiftly scored again to effectively seal victory. "Playing for 20 minutes with only 14 men on the field is tough," noted head coach Vern Cotter, who felt his team fell foul of some interpretations by referee Pascal Gauzere. "I need to have a closer look. I thought we had the penalty a couple of times, I thought we got over the ball a couple of times when they were isolated, and the referee saw it a different way. "We had to adapt to that fairly quickly after the yellow card to John. I thought we were pretty good over the ball there, and that's the way it goes. "It wasn't an easy game to get control over, but the boys kept trying and once we had our hands on the ball, that's one thing we take from the game. "If we rid ourselves of a few errors, hang onto the ball and start developing those plays, that's good. This game will be used to move us forward and improve next time we come together."